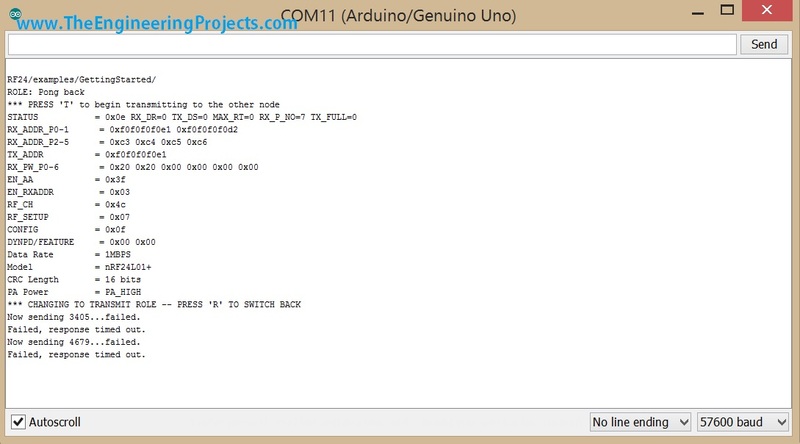 A complete tutorial on How to resolve "Failed, response timed out" problem for NRF24L01+ with Arduino. As you can see in the above figure, in the last lines we are getting error that “Now sending 4679…failed. Failed, response timed out.” So, that was the problem which I encountered almost for half an hour and then I finally realized what I am missing and how to solve it. Before going to the solution, let me first tell you the types of this modules. When I encountered this problem, and instead of lot of efforts and not being able to resolve it, I finally thought of using the old module, so I searched for it and luckily I found one of them. So, now I plugged this new module with another Arduino and I checked the properties of both these modules (i.e. the old one and the new one) and for that I simple uploaded the below sketch in both of my Arduino boards and opened the serial terminal. In this sketch, I simple print the details of NR24L01 module, so I uploaded the above sketch in both the Arduinos, one with old NRF24L01 module and the one with new NRF24L01 module, and I got the below response. 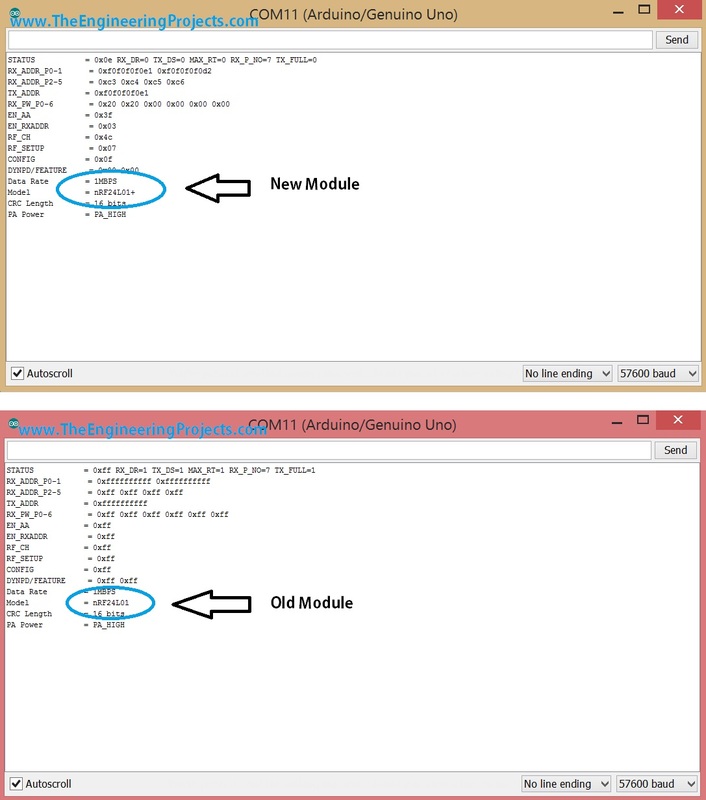 Now I got the reason that why I am not getting the response for the same code, which worked on the old one, because the old module model was NRF24L01 while this new module is NRF24L01+ which is slightly different from NRF24L01. So that’s the reson why I was constantly getting the Failed, response timed out error for this module. So, now lets have a look on how to resolve this issue. So, I started looking online and get its datasheet which helped a lot and finally I got the thing. NRF24L01+ draws more current than NRF24L01 while starting up and Arduino couldn’t provide that required current to it. That’s the reason NRF24L01+ failed to initialize and couldn’t send or receive the response. So, that’s the simple solution which kept me on for around an hour and then I finally got it. As you can see in above figure, its exactly the same circuit diagram and the only addition is the capacitor placed between 3.3V and the GND. Great work. Do you have any plan for making library model of NRF24L01 device for Proteus simulation?? Nops not yet bro, because it works on SPI so that’s a bit difficult to design in Proteus. Hi, I’m trying to use NRF24L01+ with aurduino to determine the distance and relative position(if possible) of the receiver wrt the transmitter. I have two modules, which when connected the same computer are giving me values in terms of got response and round-trip delay, but when connected to different systems, it gives absolutely no data.. what am I doing wrong?? Thank you so much for this contribution. I would like to report that I had success with a polarized capacitor as low as 2.2uF running on PA_MAX with a 3mm LED blinking on reception. 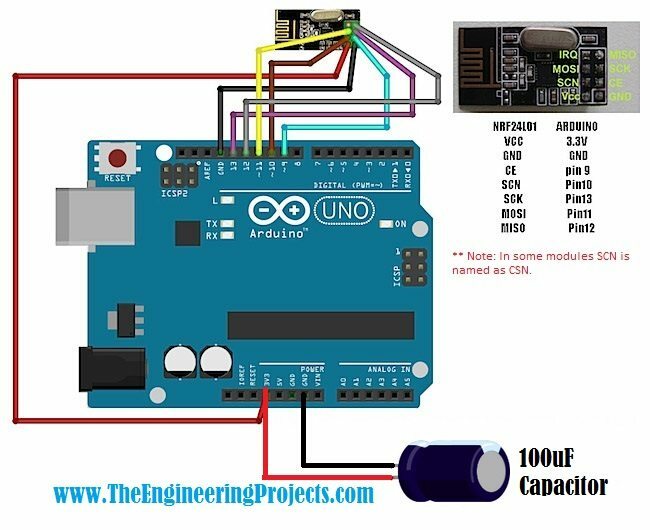 So you don’t exactly need a 100uF capacitance, but that would also depends on other components of your circuit, of course!